Mattern Family: Its My Party And Ill Pray With Eyes Open If I Want To. Its My Party And Ill Pray With Eyes Open If I Want To. Our son turned seven yesterday. Ouch. My baby is seven. He is such a special little guy with his very own uniqueness to him. I love it. I don't want him to be normal. I like him just the way that he is, eyes open during prayers and all. We don't do your typical birthday parties. Yup we are weird. We are not against it. 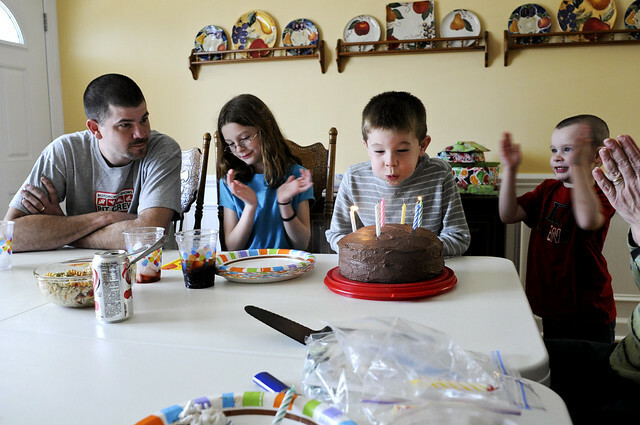 Our kiddos get to choose, birthday party or a day as a family. So far they have chosen to keep it family days. They look forward to their special day all year, my middle daughter actually keeps notes on what she has planned for it. Here's why: They get to be the boss for the day. They get to choose what is on the menu for the day and what things that we get to do on the agenda. My son chose pancakes for breakfast including syrup and peanut butter. (If you have not tried this you are truly missing out) and home made pizza for dinner. He chose for us to go see Yogi Bear and eat popcorn for lunch. He usually chooses laser tag but made a deal with his older sister that he would chose this movie if she would chose tag. Aren't they funny! The grandparents usually throw their own mini celebrations. The kids enjoy the attention, the special cakes, and playtime with the cousins. We treasure these special days. I cant believe how fast they go by! Can't believe he is 7! We did homemade pizza for Kimberly's 9th bday a couple of weeks ago- it's the best:) Happy Birthday little man! I love this idea. My mother used to let us choose our birthday meal when I was growing up. It made the day feel special. You take it to a new level that works even better. Great photo and headline, by the way! It was my birthday yesterday too, funny! I love simple home based celebrations. that is exactly what we do, and they always love family day too. they love picking the menu, i think that is their favorite thing about the day :)looks like you had such a wonderful time celebrating that little guy! I love the look on Isaiah's face. The time flies. I don't know where it goes. I love how you celebrate. We are doing the same. I allowed a large party last year for Helena and Elijah. That was the first and last, much to Helena's chagrin. I think there are terrific simple ways to celebrate and I love how you did it. I don't think you are weird at all. I think we will try some of the things you do! Thanks for chatting over at my space! Looks like a great day! Our boy will be 7 this year...oh my. I'm really loving digging into your blogs (especially being a homeschool family) Have a great weekend!